These encounters are demonstrative of an important principle that should guide students seeking out and participating in community service opportunities: the very same rules that apply to the rest of the application will apply to your volunteer work. Thus, just like other extracurricular activities, not all volunteer work is equally valuable, nor is it interchangeable. While there is no singular “right way” to select and participate in volunteer work, there are innumerable wrong ways. The purpose of this blog is to help you understand why community service is important and help you use community service to bolster your application and help you stand out. Community Service Can Help You! Community service is important for a number of reasons. First, and most importantly, it’s the right thing to do, especially for students who come from affluent or privileged backgrounds. As a competitive student, you should not just being doing community service to get into selective universities. Community service will help you improve as an individual. Thus, even if there was no admissions benefit to community service, I would still recommend it. Second, community service demonstrates a level of civic and community engagement that conveys to admissions officers that you will likely contribute significantly to their campus community. Fourth, community service or volunteer work reflects positively on your personal qualities. From the perspective of an admissions officer, seeing affluent students who have made no effort to give back to their community or to support individuals in need does not bode well for their personal characteristics. Volunteering is a great way to show that you are not just an impressive person, but you are good person too. 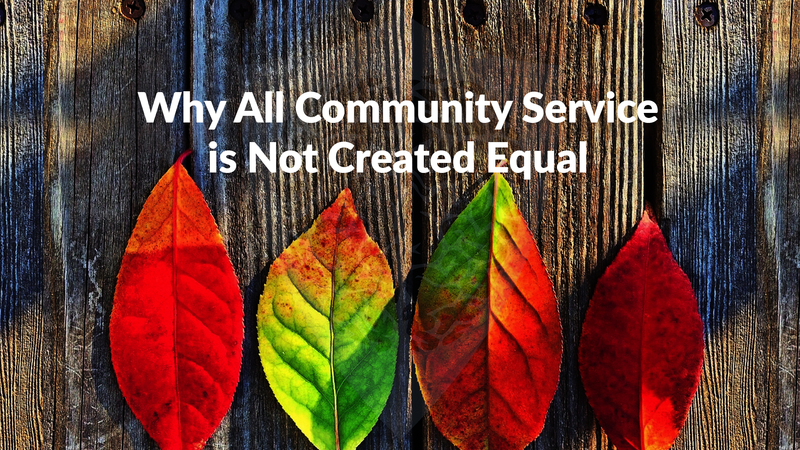 Just like any other extracurricular activity, not all community service is created equal. Admissions officers evaluate - whether consciously or subconsciously - several factors. Relevance: Relevance is easy to explain and understand. It is simply a measure of how related the community service activity is to your other interests or your Application Persona. Volunteer work that is highly relevant to your other interests will appear more authentic - i.e., less like you did it solely for the benefit it confers during the admissions process - and will also help round out your interests. For example, if you are interested in public health and intern at a local hospital, it would not only give the appearance of genuine interest, but it would also help foster an image of you as a future pioneer in that field. On the other hand, it may not make sense to participate in prosaic programs like Habitat for Humanity unless you wanted to become, for example, a carpenter (obviously, this is a generalization, but you get the point). Thus, if you are interested in politics, volunteer for a local campaign or political party! Interested in fitness and health? Teach some basic nutrition and exercise to young students in underserved areas. Like computer science and environmentalism? Create an app that helps people recycle. The point is, there will never be one right way to volunteer, so long as what you are doing is related to your interests and follows the other advice below. Focus: With community service, more is often less. Students who participate very little in a large number of volunteer activities look decidedly less impressive than students who have committed large amounts of time to a smaller set of activities. As with extracurricular activities generally, being a dilettante does not pay off. There is value in limiting the various topics for which you are volunteering. For example, even a student who commits ample time to all of their volunteer activities would be better served focusing on one central issue - such as education - rather than spreading themselves across numerous issues (e.g., education, politics, environmental protection). Admissions officers from many of the top universities prefer students to limit themselves to one cause or issue. Although there is not hard-and-fast rule, you should generally stick to 1-2 “issues,” and limit your involvement to fewer than four different activities within those issues. In some cases, isolated volunteer experiences, such as a summer-long international service trip, cannot be continued and may naturally evolve into a new activity during the school year. For example, if you were to work at the Selamta Family Project in Ethiopia - one of InGenius Prep’s non-profit partners - and then return home and begin working at a local orphanage, it would be totally acceptable, and would not convey a lack of focus. In fact, this is a far preferable alternative to simply abandoning orphanage work after the summer in Ethiopia. When you are interviewing and hiring someone for a job, you generally interpret the number of years they have spent in the workforce as representative of their expertise, depth of engagement, and knowledge of a particular industry. Admissions and community service are no different. Time spent matters. Not just the number of hours, but the period of time over which you have engaged in the volunteer work. As you know, all of this information - hours per week, weeks per year, and which years - will be included in the Common App or other application. Thus, planning long-term and not trying to cram volunteer work into the final year of high school is essential. Students should generally begin volunteer work during their Sophomore year or the following summer (or, in some cases, even earlier). Again, there cannot be a singular rule for how much time students should commit. That said, four years is better than three, three is better than two, and anything you add last-minute will presumptively be regarded as intended solely for the purpose of helping with admissions. So, we can safely assume that your should participate for a minimum of 2-3 years, for maximum effectiveness. With respect to hourly commitment, there is again, no singular rule that will apply to all students. Generally speaking, commitments which are less than one hour per week are viewed with some skepticism, as are very short (< 1 month) engagements which are something other than a summer program. Try to invest at least one hour per week for at least half of the year. With just a few hours a week, you can have impressive experiences that will help you get into Ivy League schools. As with all activities, leadership is important. Generally speaking, it is better to start something than to join it, better to lead it than to merely be a member, and better to be a member than nothing at all. Community service is no different, and you should seek out not only opportunities to become a leader in pre-existing organizations, but also to start something of your own. For example, we had two students who together started a project during their freshman year called the Little Lantern Project, which gathered second-hand books and donated them to schools in Tibet. They got a number of their other friends involved as well, and by senior year, they had more than 10 volunteers and had donated thousands of books. Much more impressive than “member of school recycling club,” isn’t it? Participating in community service is always a great experience. Not only will it show your commitment to helping others, but you will grow as an individual. Sure, it looks good to have community service on your application. But remember: tie your community service to an overall theme of your application instead of having just random volunteering hours. Admissions officers are looking for students with passion. If you can show your passion through community service, you are bound to stand out.